HFATW Get Heart Better is a program that provides free training for cardiologists participating in the association and a training for health personnel who will take care of the management of the patient with myocardial infarction or operated to the heart in the first and second phase of cardiological rehabilitation. It is also useful in the clinical stability phase following a heart failure. 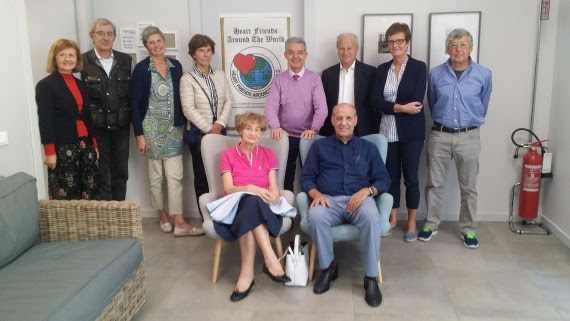 The HFATW Get Heart Better program will then be performed at home by the patient, returning to the third phase of rehabilitation and secondary prevention programs. With the appropriate measures, it also lends itself to be useful in primary prevention of chronic diseases as it has been demonstrated its validity in the control of mental and emotional stress and in increasing, through the brain heart consistency, the Heart Rate Variability, measurable and referable to the health of the heart. Once the consistency of the heart is obtained, it is possible to increase the resilience to the state of illness through awareness, mainly obtained through meditation on the present moment and the acceptance without judgment of cenesthetic, auditory perceptions and compulsive thoughts that may appear during practice. The part of scientific exploration related to Quantum Mind is based on the ability of operators to perceive the biofields with the second attention, to enter the state of awareness of non-awareness, such as the one existing in the space between two thoughts and to make the transformation on the basis of intention, an innovative process based on the ability to have experience of bringing the principles of quantum physics into clinical practice. With the appropriate training all the health workers involved in the first and second phase of rehabilitation can achieve the desired results. The patient, after the teachings received, will be able in turn to retrace the various steps of the method, stabilizing the results obtained over time.